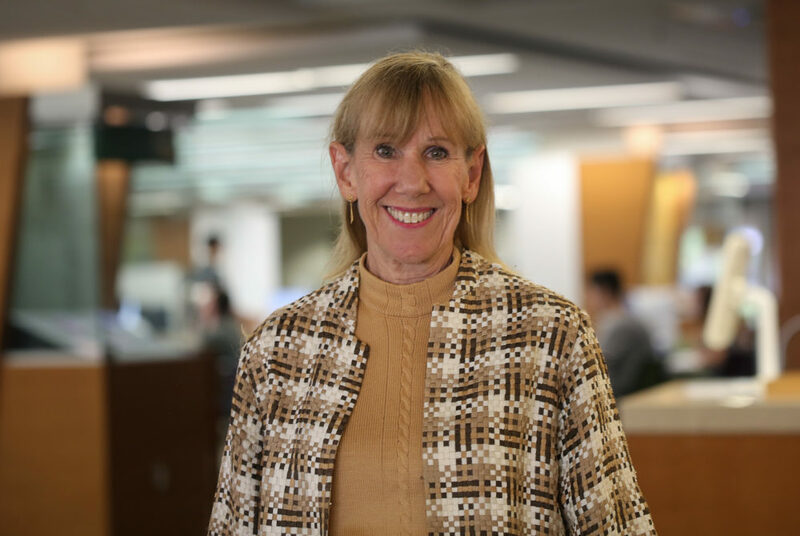 Geneva Henry, the dean of libraries, said library staff will now collect questions commonly asked by students and use the information to expand Academic Commons, which opened in Gelman Library last month. Updated: Sept. 4, 2018 at 1:33 p.m. When the dean of libraries and academic innovation ventured out of her office on the seventh floor of Gelman Library to help student workers last week, she didn’t expect to be hunting down A4 paper. Where to find long, European-style paper was one of the nearly 700 academic questions students asked employees at the library’s new Academic Commons last week – and Geneva Henry, the dean of libraries, said the resource center is prepared to answer all of them. Henry said library staff will now start collecting feedback from students, faculty and staff through surveys and focus groups to continue growing the center. On the entrance floor of Gelman Library, the newly organized space, now dubbed Academic Commons with new signs and a logo, brings together many of the University’s academic resources in one place, including peer tutoring and textbook rental. Henry said during the first week of classes, she noticed students were accustomed to being passed on to multiple departments if a library staff member didn’t have an answer to their question. Most students were “shocked” when she would not let them leave without an answer – which illustrates the “frustrating” culture Henry said she’s trying to change. “Our whole goal is to help you and to get you to the right place, or if we can be the right place or just solve the issue right there so you’re not running all over campus trying to find things out,” she said. The center – a product of Student Association advocacy – opened Aug. 1 alongside a new website offering help with 15 different topics, including peer coaching, study spaces and an online syllabus bank. The University put ads on Blackboard to promote the space and encouraged professors to include information about the center in their syllabi. “We’re building a mindset and the culture that this is all about helping people find information,” Henry said. Henry said Academic Commons staff now tracks every question students ask at the library’s front desk on new iPads. She said officials will use the data to decide how to expand the services the center offers over the next semester and year. She added that the library will host student focus groups and talk to faculty and staff throughout the year about how the center and website can be improved. “It is just the variety of questions that we’re getting that is helping us figure out what other stuff we need in there,” she said. With the library’s limited income and staff cuts two years ago, Henry said pulling the center together in just a few months was a “killer” – but that the staff’s “passion” for the student-centered project made the initiative achievable. Administrators officially announced the center would open in April. Former Student Association President Peak Sen Chua and former Executive Vice President Sydney Nelson said they were surprised by how quickly the Academic Commons came to fruition. The pair initially proposed the center to administrators in the fall and helped develop the resource hub over the course of the year. “They’re really seeing how can they serve students and really create the best academic experience possible, which I think a lot of other areas in GW could learn from them when it comes to advocacy work and the student experience,” Nelson said. Administrators from academic resource centers at other universities said that to ensure the long-term success of the center, officials need to receive feedback from students and maintain fluid communication with any divisions involved in the center. Sue Bierman, the director of the Altshuler Learning Enhancement Center at Southern Methodist University, said faculty members have been her best resource to get students to take advantage of the center because they could talk to students directly. She said having faculty workshops on how to teach material better could also help connect professors with the academic mission of the center. “The faculty who’ve been there for a while may not realize things have changed and things are located different places,” Bierman said. Rachel Remmel, the assistant dean and executive director of the Center for Excellence in Teaching and Learning at the University of Rochester, said putting an academic resource center in a campus library will encourage students to use the center because they are familiar with the space. “If you’re going to have a one-stop-shop, you really do need it to be in a building that everybody knows about and they’re using all the time,” she said. Jody Caldwell, an associate librarian at the Academic Commons at Drew University, said keeping in constant communication with officials and staff helped integrate departments that were working with each other for the first time at her university. The Academic Commons website has links to other websites where students can find information about services like Disability Support Services and the IT Support Center. The new “study spaces” search linked on the website is still in its “beta” version, but Henry – the dean of libraries – said it will be finished by the end of the semester. “It would be nice if there were some programs that showed us working together for the students, so the students could also see us as one-stop shopping,” she said. The Hatchet incorrectly reported that the Academic Commons website is still in its beta version. The website is fully launched, but a new “study spaces” website linked on the page is in its beta stages. We regret this error. This article appeared in the September 4, 2018 issue of the Hatchet.